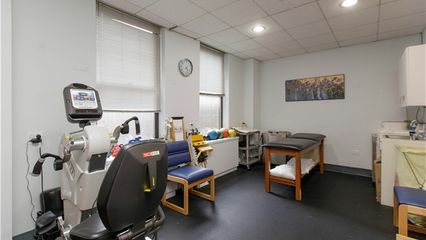 Therapeutic Inspirations - East 32nd St.
Brian Lau, DPT Brian strives to provide the best care possible! His focus is solely toward the restoration of physical function & quality of life of his patients. He finds no greater satisfaction than helping his patients achieve what they thought they could never regain. He began this journey by earning his Doctorate in Physical Therapy from Stony Brook University. As a physical therapist, Brian is always striving to advance his skills by taking continuing education courses and studying techniques use by leaders in the world of physical therapy including Dr. Brian Mulligan, Dr. Shirley Sahrrman, Dr. Mckenzie, and Maitland. Brian is proficient in the GRASTON TECHNIQUE for stretching connective tissue and muscle fibers. When not treating patients, Brian is an avid Sport spectator of UFC and fan of all NY local teams. Ali is a graduate of Boston University's Physical Therapy School, and since graduation 15 years ago has been winning over the hearts of her patients while helping them recover from a multitude of physical impairments. Ali has extensive experience utilizing skilled hands-on techniques. She can use manipulation/mobilization to diagnose and treat soft tissue and joint structures, in addition to modalities and exercise to help modulate pain, increase range of motion, reduce or eliminate soft tissue inflammation, induce relaxation, and promote tissue repair, all while facilitating movement and improving function. Ali is certified in Graston soft tissue mobilization, kinsesio and Rock tape application and APOS orthotic creation. Ali is an accredited member of the highly regarded NYU hospital referral network. Swati has earned Bachelors degrees in Physical Therapy from University of Pune, India and a Master's in Applied Public Health Nutrition from The Karolina Institute, Stockholm, Sweden. She is an NY licensed PT and has 10 years of work experience. Swati believes in a comprehensive and integrated approach to optimize movement and restore function. She utilizes different manual and soft tissue mobilization techniques, therapeutic exercises, modalities and patient education to help manage pain and restore function. She is a Garston Technique provider and a certified Rock tape provider. In her free time, Swati loves to cook and likes to travel.